This is the EASIEST, TASTIEST Tortellini Soup EVER! This recipe for tortellini soup only requires four staple ingredients that easily come together to create a hearty, delicious, comforting soup. Tortellini is one of my favorite soups ever! From these cheese filled pasta, to the hearty greens, to the rich tomato broth, tortellini soup satisfies to the core. 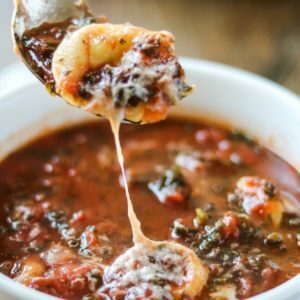 This tortellini soup is filled with hearty tortellini, healthy greens, and is ready in less than 30 minutes. And it comes together with just 4 main ingredients. Vegetable or chicken stock both work. It is essential to choose a very flavorful homemade tomato sauce or good quality store bought sauce, as this is what flavors the tortellini soup. If your tomato sauce is well seasoned you will not need to add any flavoring to your soup. But extra garlic, dried oregano, or red pepper flakes are great optional add-ins to this tortellini soup. Bring stock and marinara soup to a boil. If using FROZEN spinach or kale, add at the beginning of the cook time. Once the broth is boiling, add in the tortellini and reduce heat to medium. If using FRESH spinach or kale, add now. Simmer the soup until the tortellini is tender. So grab a spoon and dig in. This soup will warm you to your core. The secret with quick, simple meals is the quality of ingredients. With that said, be sure to use quality marinara sauce, good vegetable stock and fresh or frozen tortellini. If you don’t have vegetable stock, use chicken stock as long as you are not Vegetarian. If you have an extra 10 minutes, saute garlic and onion in 1 tablespoon olive oil before adding marinara and stock–but remember, you can skip this step as most marinara sauces are already filled with deep flavor like my homemade tomato sauce. We’ve been eating kale more and more. I’m actually surprised at how much we like it! Adding this to the list, thanks! This is one way to eat kale everyone will love. What a yummy reason to make an extra big batch of spaghetti sauce! 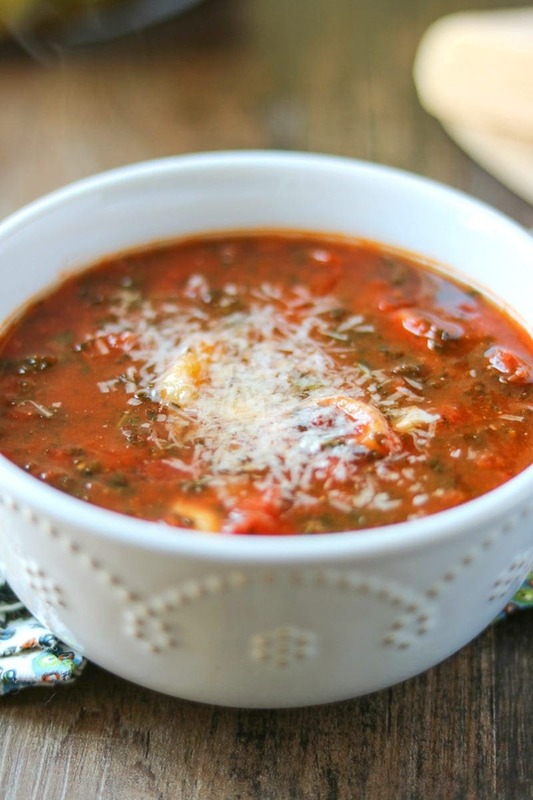 Love this easy, delicious soup! Extra spaghetti sauce is never a bad thing! Yum! This looks fantastic! Perfect for all of the cold days! Looks great! Easy and simple yet so flavorful! I am in LOVE with this recipe! Can’t wait to make it! Could you substitute the Kale for Spinach instead?? Absolutely! In fact a reader just sent me a picture of the soup yesterday that they made and they used spinach 🙂 Enjoy! How many calories per serving? It sounds wonderful! Hi Theresa! So the number of calories will be dependent on what tortellini and marinara sauce you use. Based on my homemade sauce and refrigerated cheese tortellini, this soup is about 250 calories per serving 🙂 I hope you enjoy!